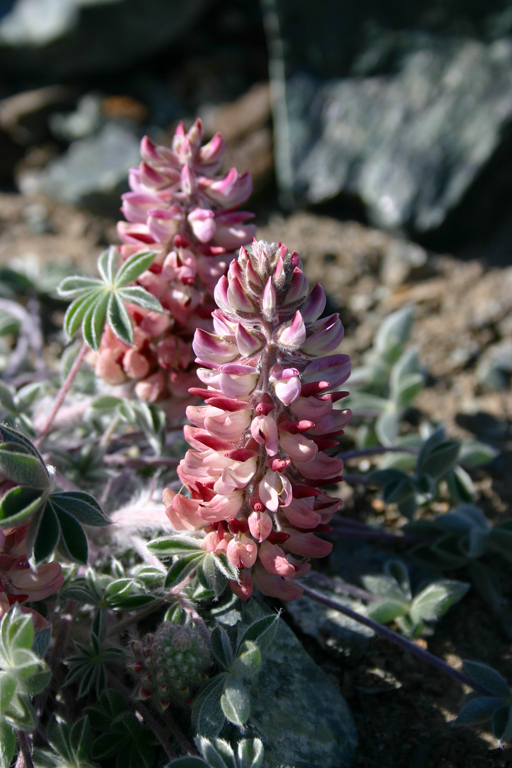 Anyone who has had the pleasure of seeing the Lassics lupine (Lupinus constancei) up close knows that it is among the most attractive of all the California lupines. The striking white, pink and rose flowers—contrasting with its silvery-white foliage on the barren rock slopes where it occurs—is simply magnificent. 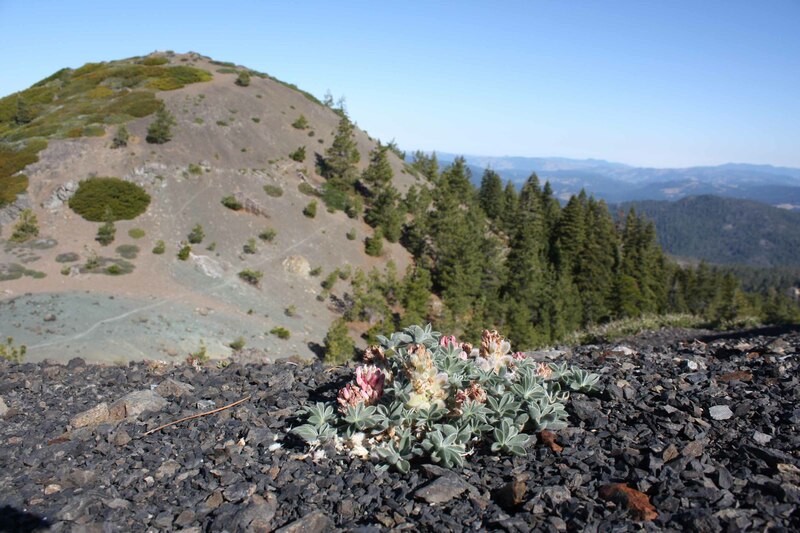 Endemic to less than four acres on the upper slopes of the Lassics Mountains in eastern Humboldt County, it depends on sufficient snowpack and shelter from summer heat to survive. The Lassics Mountains are widely known for their exceptional botanical diversity and rare species associated with the ultramafic (high in magnesium and iron) soils. The CNPS North Coast Chapter has been active in conservation efforts aimed at the lupine for more than 20 years, including several cost-share agreements with the U.S. Forest Service, and assistance in inventory, monitoring, and other tasks. Based on annual monitoring conducted since 2005, the population of mature Lassics lupine has declined from more than 600 in 2014 to roughly 130 in 2016. An estimated 580 seedlings germinated this year but, based on historical data, 95 percent of those are not likely to reproduce. Extensive research by US Fish and Wildlife Service and U.S. Forest Service scientists has indicated a variety of factors responsible for this decline, including seed predation by small mammals due in part to and forest and chaparral encroachment into its open habitat. Since 2003, most of the physically accessible reproductive plants have been caged to prevent seed predation. A population viability analysis conducted in 2012 suggested the caging was critical to stabilizing the species in the short term. Changing climate, however, poses a new threat to the species. Drought over the past five years, the virtual absence of winter snowpack, unusually high summer temperatures in 2014 and 2015, and the Lassic Fire of 2015 have pushed the Lassics lupine to the brink of extinction. Virtually the entire distribution of the species is within the 7,000-acre Lassics Wilderness, managed by Six Rivers National Forest, which—in this area of the forest— is surrounded by either private or National Forest timberlands; this severely limits the feasibility of allowing lightning-caused fires to burn naturally. After decades of fire suppression, manual treatment followed by routine prescribed fire is needed to restore and maintain much of the Lassics lupine habitat. Unfortunately, that same habitat offers the species the best available refuge from climate extremes. Although multiple policies allow and often mandate the Forest Service to take specific action to conserve this species, Six Rivers National Forest has not implemented habitat restoration nor aggressively pursued recovery actions. Over the past decade the U.S. Fish and Wildlife Service and CNPS have repeatedly asked the Forest Service to give priority to saving this species. These requests have been ignored, ostensibly due to conflicts with wilderness values and forest priorities or lack of funding. As a result, a petition to list the lupine as Federally Endangered was filed in January 2016. This would force the survival of the species to be considered in any actions taken by the Forest Service, and would require development of a formal recovery plan for the species. To help spur the Forest Service into action, we petitioned for State listing in July. Not only could this lead to increased potential for funding from the State, but Federal guidance on management of wilderness areas recognizes an important role for state decisions affecting fish and wildlife resources in wilderness. As the trustee agency for fish and wildlife resources statewide, we believe the California Department of Fish and Wildlife has a shared responsibility for saving the Lassics lupine. What can you do to help the Lassics Lupine?